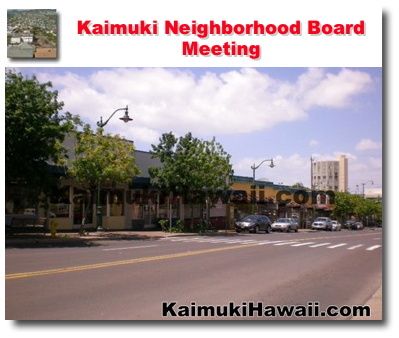 LAST MEETING NOTES - Click here to read Kaimuki Neighborhood Board Meeting August 2018 Minutes minutes notes prior to the meeting scheduled below. III. 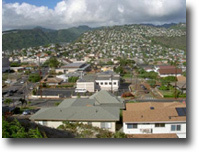 FILLING OF VACANT BOARD SEATS: There is one (1) vacancy in Sub-District 1, East Kaimuki. Residents interested in filling a vacant board seat must bring current proof of residency to the Board meeting. IV. PUBLIC INPUT: Limited to three (3) minutes each. Items that are not listed on the agenda may be discussed but no Board action may be taken. VI. ELECTED OFFICIALS: Limited to three (3) minutes each. A. Formation of Permitted Interaction Group (PIG) to collect demographic data and set up a survey to define Kaimuki Character and other information. Discussion of other topics that should be considered for either a PIG or Committee. A. The next regular Board Meeting will be Wednesday, October 17, 2018, at Kaimuki Christian Church, Fellowship Hall, 7:00 p.m.
A mailing list is maintained for interested persons and agencies to receive this board?? ?s agenda and minutes. Additions, corrections, and deletions to the mailing list may be directed to the Neighborhood Commission Office (NCO) at Kapalama Hale, 925 Dillingham Boulevard, Suite 160 Honolulu, Hawaii 96817; Telephone (808) 768-3710 Fax (808) 768-3711; or call Christopher Naylon at (808) 768-3770 or e-mail chris.naylon@honolulu.gov. Agendas and minutes are also available on the internet at www.honolulu.gov/nco.